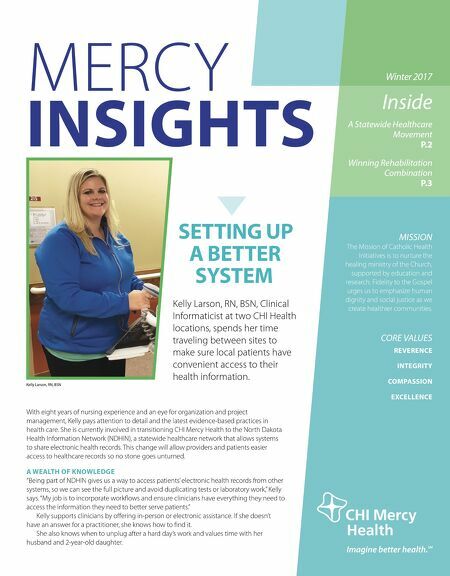 INSIGHTS MERCY Winter 2017 MISSION The Mission of Catholic Health Initiatives is to nurture the healing ministry of the Church, supported by education and research. Fidelity to the Gospel urges us to emphasize human dignity and social justice as we create healthier communities. CORE VALUES REVERENCE INTEGRITY COMPASSION EXCELLENCE Inside A Statewide Healthcare Movement P.2 Winning Rehabilitation Combination P.3 Kelly Larson, RN, BSN SETTING UP A BETTER SYSTEM Kelly Larson, RN, BSN, Clinical Informaticist at two CHI Health locations, spends her time traveling between sites to make sure local patients have convenient access to their health information. With eight years of nursing experience and an eye for organization and project management, Kelly pays attention to detail and the latest evidence-based practices in health care. She is currently involved in transitioning CHI Mercy Health to the North Dakota Health Information Network (NDHIN), a statewide healthcare network that allows systems to share electronic health records. This change will allow providers and patients easier access to healthcare records so no stone goes unturned. A WEALTH OF KNOWLEDGE "Being part of NDHIN gives us a way to access patients' electronic health records from other systems, so we can see the full picture and avoid duplicating tests or laboratory work," Kelly says. "My job is to incorporate workows and ensure clinicians have everything they need to access the information they need to better serve patients." Kelly supports clinicians by oering in-person or electronic assistance. If she doesn't have an answer for a practitioner, she knows how to nd it. She also knows when to unplug after a hard day's work and values time with her husband and 2-year-old daughter.